Vanee Spaghetti Sauce with Meat is a rich blend of ground beef, tomato sauce, and authentic Italian spices, simmered to perfection. 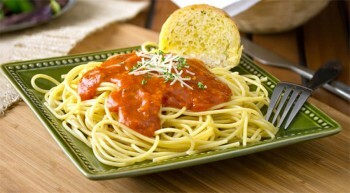 Great for pasta, sandwiches, or with garlic bread. 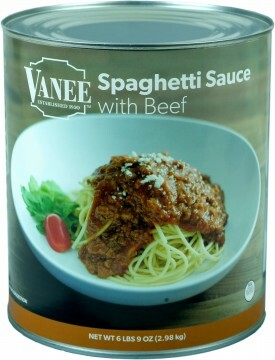 Vanee Spaghetti Sauce with Meat is shelf-stable for easy storage, ready-to-use to cut down on prep time, consistent from batch to batch, and has a convenient pack size. Each 105 oz. can has 22 half-cup servings, for a total of 132 servings per case. Great for pasta, sandwiches, or with garlic bread. Tomato, Beef, Food Starch - Modified, Salt, Sugar, Textured Soy Concentrate, Spices, Onion Powder, Citric Acid, Garlic Powder.